summer! It's official here, we took Papa to work this morning as it's the beginning of the in-service days for the high school here. Little sad for us this morning but exciting as well. It means Fall, (my favorite season) is fast approaching, football games, cool days perfect for playing hard outdoors, MOPS group meetings, more time for me to play with Zoey as well as more time for me to scrap, library story hour starts again soon, music garden, baking, apple picking, pumpkins...I could go on and on. Love it! This year for our fundraiser for MOPS we have asked a photographer from Menasha, Wisconsin to come and provide a photo shoot for people to get vintage inspired photos taken of their children. Since I work at the local scrapbook store I prepared a layout featuring one of the photographer's photos to help get the word out about the upcoming fundraiser (it was displayed in the store and on the Baker's Wife Blog) and since have been asked to provide the layout for the photographer's business website for advertising purposes! You can view it here. It's the last one on the page listed as provided by The Baker's Wife. Pretty fun to see something that I made on their site! I'm juggling quite a few projects right now, but am finding that I am enjoying all of them. Looking forward to sharing them soon. Seems that time has been flying by here, looking forward to the possibility of things slowing down a bit here, for Zoey and I at least. Here's to the start of a new school year. I am so excited to have been asked to join the team of freelance designers at My Kits & Pieces! Totally thrilled! I submitted my application a couple weeks ago and just found out recently that I was accepted. Really excited to be a part of the team...so many talented ladies are there, it's going to be a fun experience. 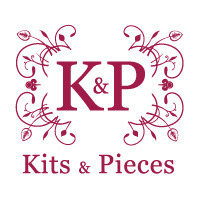 My Kits & Pieces offers an inexpensive base kit for people to purchase and then offers add-ons of embellishments and other goodies as well in different price ranges/sizes. Come join in on the fun at the forum too...if you do, please let me know that you're there! Life has been crazy hectic here lately, thus the lack of posts here on the blog. Last weekend I had the MOPS retreat to attend which is when all the planning takes place for the upcoming semester. This is my first year as the Arts & Crafts Coordinator and I am excited and nervous. 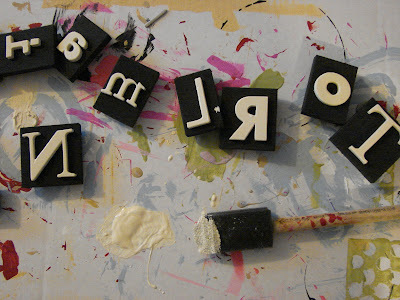 Excited about some fun project ideas that I have and nervous about the slim budget that I am allotted to "play with". That's probably where I'll need to get a little creative, I sure would be open to any and all frugal ideas regarding crafts that would be fun, simple and aesthetically pleasing to many!!! Really, I think that I'll be able to swing things, just hope that my critics aren't too harsh is all! The retreat was Friday and Saturday and held at a cabin up here, which meant the first time that Papa put Zoey down for the night rather than Mama...we prepared her and she did beautifully! So cool when you take the time to listen to your child and truly understand and appreciate their fears and feelings and then to see the day when you have to step away and have new experiences take place and have that child be confident and ready for that change...wow! Awesome not only for Zoey but for me as well! I really feel good about sticking with my gut feelings of staying with her and supporting her need of being close with me these beginning years. I really feel that her growing confidence now is because of that nurturing. She is such an amazing and cool little person! So proud! Also this week Zoey and I were invited to and went to a princess birthday/tea party. The princess' all had a glorious time! To be fair there was one prince in attendance. 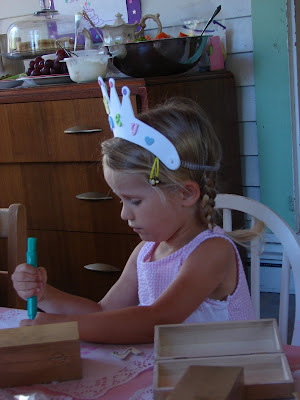 All the kids made crowns, jewelry boxes (for their jewels) and had "tea" and cake. I got to hold a 3 month old during a large duration of the party as the mother was also the mother of Zoey's friend that was turning three so she was running around taking care of the three year olds most of the time. It was so fun to hold a little tiny babe again! You totally forget how little they are and how much they sleep! Zoey was very much in awe of the baby and kept wanting to pat it on the head and kept wanting it to wake up. She is such a little mama already, if she had a sister or brother I think she would be in heaven! So fun to see that interaction take place. One of my best friends just recently announced that she's expecting so maybe I have babies on the brain!) I also met a few new moms, which was nice as well. We snuck some time in to do some hiking this week, really hoping that we can get some more of that in before school starts for Ethan. Though, my most favorite times spent outdoors is spent in the Fall before it gets really cold. LOVE it when it starts getting colder...it's getting cooler here already!!! We actually baked today and it was so nice to have the windows open with that warmth from the oven spreading it's way through the house. I totally am anticipating the change of seasons and ready to embrace it head on. Love pulling out those sweaters and sweatshirts, being able to snuggle and cozy up in blankets again...reading books and drinking tea. Football games, time with Zoey again, trips to the library. Yep, I'm ready! It's amazing to me just how fast Ethan and I have been accepted into and feel a part of this community. I truly feel that we are in the hub of the stuff that's really happening here. I am so glad that we get to call this place home. and the art that he creates. Love that I grew up around such a creative soul. Love that I saw his determination, hard work, and dedication to his craft first hand. Love that he let me "play" around him while he was working in the studio. Love that on any given day there may have been classical, rock and roll, alternative or some other eclectic mix of music blaring from the stereo speakers while he was painting. Love that my Dad drove an old bread truck (used for transporting his larger works) and that I got to go with him on location while growing up for many of his installations. Love that he never told me what he was painting, but asked me what it was that I saw. Love my Dad so very much. 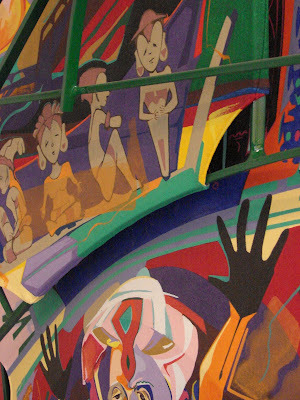 You can check out more of his work here. This week's challenge for Inspire Me Thursday was diary and you were to interpret it however you wished. I was actually working on this page for my personal art journal as I've been reflecting on putting myself "out there" more artistically lately and thought it fit in perfectly with this week's challenge so thought I'd share. Basically this layout is based on a Moorish Proverb that states He who is afraid of a thing gives it power over him. It seems for such a long time in my life I had that voice of doubt or fear saying that I wasn't good enough, or smart enough or whatever the worry, I wasn't strong enough to stand up and be proud of me and what I could do and what I could offer the world and those around me. (To be fair, for quite some time I wasn't even sure what exactly the "it" was that I had to offer.) 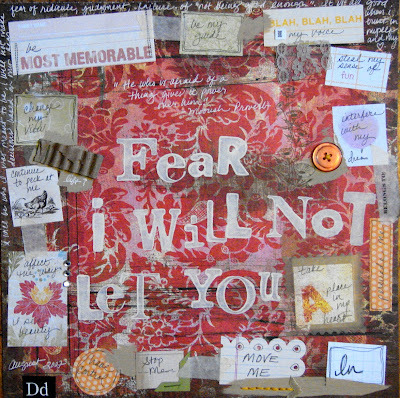 Through scrapbooking and journaling I've found my voice and realized that it's strong, loud and clear. Turns out I have a lot to say and share. I can and do make connections with those around me and I am finally feel free to be me...this entry in my journal celebrates that and serves as a reminder as well so that I continue to follow the path that is only mine to walk. This song has been a favorite for a long time, (covered here by Rufus Wainwright, original by the Beatles) hadn't seen the video though until today...thought I'd share. the phrase "Jai Guru Deva Om" is "Thank Guru Deva". Jai or Jaya means "Victory" or "Success" but can also mean "Honour", "Praise", "Greeting", or "Thanks"
Deva is a title for a Hindu god or divine figure. Yesterday was the first day (in at least a month) that I didn't have to work, that we didn't have company, family visiting or plans to go somewhere or other outstanding commitments and it was GREAT! Ethan went off with Zoey for a bit in the morning to give me some time to play with some projects that have been on hold for quite some time, (I've discovered that creating for the store is much different than creating for myself!). Really felt good to sit with my own supplies, in my own chair, at my own art table and just let whatever happen, happen. 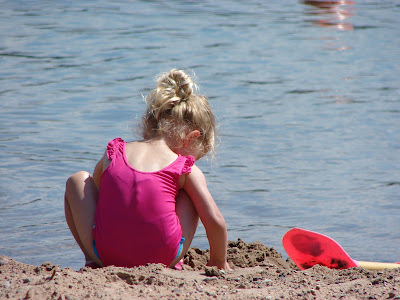 Then yesterday afternoon we spent some time at the beach together as a family. Loving being able to spend time together and having it be just us right now. So important to have that landing pad after the craziness of life. 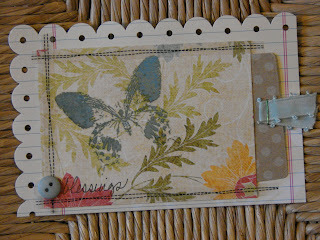 This week's prompt for the weekly Mini Art Journal Journey is count your blessings. 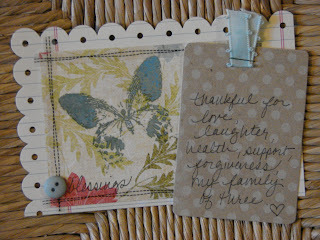 I created a little pocket to put my card in that lists my most important blessings (at the moment!). I really liked what I ended up with for this one and am almost tempted to make a whole layout surrounding this theme. I am really so thankful for all of my life's blessings and found it hard to just name a few, but here they are: love, laughter, health, support, forgiveness and my family of three. Thanks for looking!